Ribbeck Dog Sports is the place to find all the necessary forms, information, and answers to your questions about any of the exciting activities available for you and your dog. Our main focus is agility, featuring shows sanctioned by the AKC (American Kennel Club), USDAA (United States Dog Agility Association), NADAC (North American Dog Agility Council), and ASCA (Australian Shepherd Club of America). These organizations support agility for any breed or mixed breed, regardless of registration or kennel club affiliation. 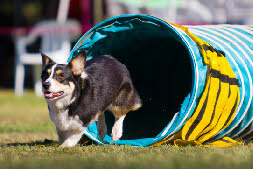 In addition, all have Junior handler and Veteran dog programs as well as the regular agility competitions.